This totally relaxing treatment painlessly creates hundreds of thousands of superficial microscopic permeations on the surface of the skin. This technique allows for greater absorption of the nutrients introduced into the skin. Therefore, you will see an immediate visible plumpness. Rezenerate acts as an infusion catalyst, assisting the products and serums we are using to address various skin issues. Whether we are targeting blemishes, fine lines, uneven skin tone, etc., the Rezenerate NanoFacial will provide you with the short and long term improvements your skin needs. In addition, the newest addition to the Rezenerate NanoFacial, our NanoGlobe ‘Zen’ Massage portion, is influenced by the pressure points of Japanese acupressure therapy, principles of Yoga facial exercises, as well as the cool touch of Cold Therapy. We customize every treatment based on age and condition of the skin. This is a fabulous choice for someone who wants a truly corrective treatment without any downtime. It is proven to restore, refresh, and renew the skin. The National Nanotechnology Initiative defines ‘Nanotechnology’ as the science, engineering, and technology conducted at the nanoscale. This is about 1 to 100 nanometers. To put that in perspective, there are over 24 Million nanometers in one inch! In fact, Nanotechnology will be responsible for breakthroughs in every aspect of human life. 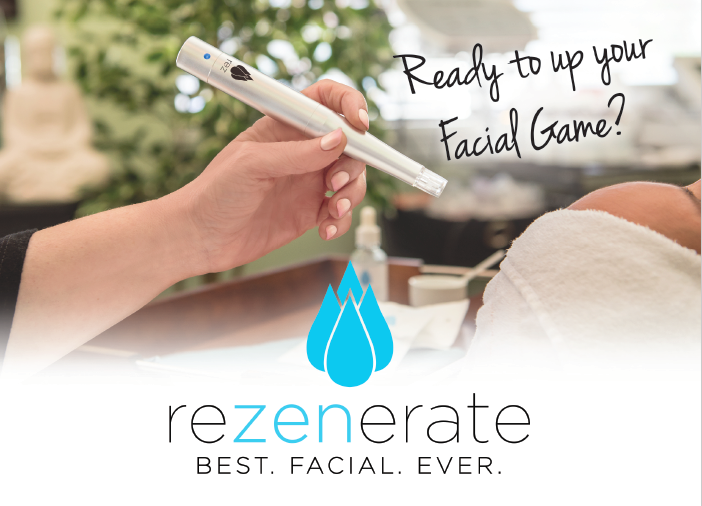 Rezenerate is proud to use it to change the face of beauty today! *We recommend a series of four to six Rezenerate treatments. These should be done over a period of two to three months to achieve the maximum results and benefits.